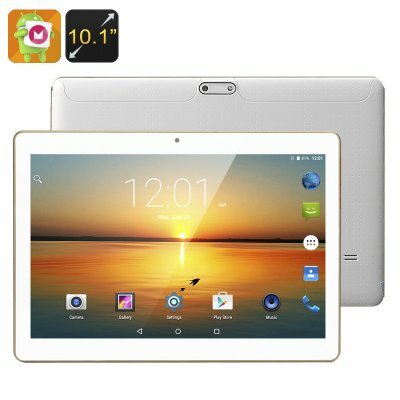 Successfully Added Android 6.0 Tablet - 10.1 Inch HD Display, Quad-Core CPU, Mali-400MP GPU, OTG Support, 4500mAh Battery to your Shopping Cart. With its Android 6 operating system this 10+ inch 3G tablet is the perfect compact gadget to bring along on your next holiday or business trip. Featuring a Quad-core CPU that has been clocked at 1.5GHz, Mali0400MP GPU, and 1GB of RAM this Android Tablet offers you the means to watch all the latest movies and play the most demanding games in HD quality. With Google Play installed on the device you literally have access to millions of free applications, movies, games, and more. No matter where you are, with this Android Tablet you are guaranteed not to be bored again any time soon. Holding a large 10.1 inch screen with 1280X800 resolutions this tablet lets you enjoy all your media files in their fullest glory. Browsing the web, playing games, watching HD movies, or simply replying to a message – the possibilities are endless with this extremely portable Android tablet. With OTG support you can furthermore connect an external hardware device such as a keyboard or game controller to you tablet, allowing you to take your overall user experience to an entirely new level. This 3G tablet holds two cameras and comes with 16GB of internal memory. Additionally up to 32GB of external memory is supported to ensure that you won’t run out of storage space for all your favorite movies, files, and pictures. Holding a 4500mAh battery this Android 6.0 tablet offers up to three hours of continuous usage time, enough to watch the average movie from beginning to end or surf the web for hours in a row – making this light weight and exceptionally portable tablet the perfect device to have with you at all times. This Android 6 tablet comes with a 12 months warranty, brought to you by the leader in android tablets as well as wholesale electronic gadgets..
Arabic: - الروبوت اللوحي 6.0 - Chinese Simplified: - 6.0 的谷歌平板电脑 - Czech: - Tablet se systémem Android 6.0 - Dutch: - Android 6.0 Tablet - French: - Android Tablet 6.0 - German: - 6.0 Tablets - Hebrew: - אנדרואיד לוח 6.0 - Hindi: - Android 6.0 गोली - Hungarian: - Android 6.0 tabletta - Italian: - Tablet Android 6.0 - Japanese: - 6.0 タブレット - Korean: - 안 드 로이드 6.0 태블릿 - Malay: - Android 6.0 Tablet - Norwegian Bokmål: - Android 6.0 tablett - Romanian: - Tableta Android 6.0 - Russian: - Планшет Android 6.0 - Spanish: - Android Tablet 6.0 - Thai: - แท็บเล็ต android 6.0 - Turkish: - 6.0 Tablet Android - Vietnamese: - Máy tính bảng Android 6.0. I was charged customs , out of Europe , Nevertheless .Good Product.